You can get your Wikli fix via facebook. If you "like" our page, you'll get Wikli alerts and the first post of discussion threads, straight to your news feed. This has been another good way for Citizens to self-identify and share information. Facebook isn't a wiki, so it won't replace what we're doing here. 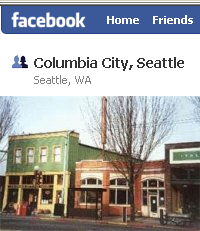 But facebook might make it easier to connect with the friends of our friends — something that makes Columbia City such a great place to be. So let's see if this helps with the community building we do here — check it out. Christo de Klerk kicked off a Columbia City group awhile back, and it's grown to several hundred Citizens. Occasionally we've used the group to contact members about community events, like BeatWalk and the heritage parade. If you're on facebook, you can join the group and invite your neighbors.